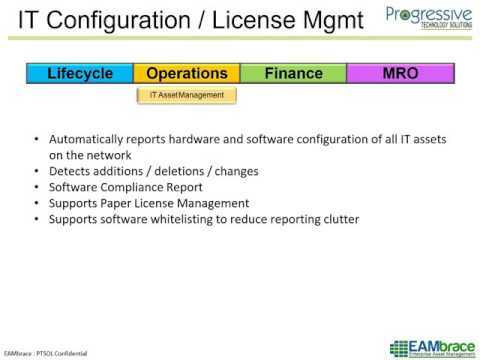 EAMbrace - Fixed Asset Management is complete solution that helps organizations maintain records of fixed assets. Complete details of each assets including cost, useful life,user, custodian, images, scan documents, location (up to 6 level), department, cost center etc. Several other dimensions can be added by creating User Defined Characteristics. The solution is comprehensive, configurable and scalable browser based solution which can meet all asset centric requirements. EAMbrace captures the complete fixed asset lifecycle management typically required by today’s Accountants and Asset Administrators. Depreciation calculation as per New Companies Act, 2013. IFRS Compliant, Support US Based MACRS Depreciation. Provision to create additional user defined depreciation books. Asset AMC/Warranty/Insurance Tracking with provision to attach scan documents. Attach asset image, purchase order, vendor invoice and other documents along with asset. Sale/Discard of assets with approval and any profit or loss can be monitored. Reminders for any pending activity via user defined email alerts. Complete web based solution with on-cloud support. Asset Tagging with Barcode / QR Codes / RFID / GPS. Rapid deployment at minimal cost.